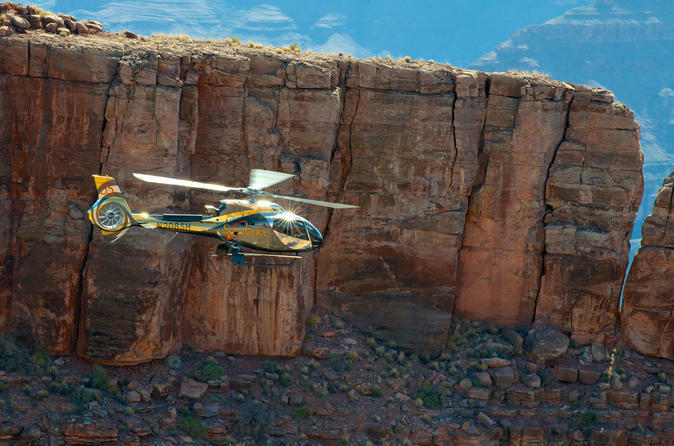 After checking in at the Las Vegas heliport, board a state-of-the-art, A-Star helicopter and gaze at gorgeous aerial views of Hoover Dam, Lake Mead, the Colorado River and several extinct volcanoes as you soar toward the Grand Canyon West Rim on a 45-minute flight. Throughout your helicopter tour, your experienced pilot will provide expert commentary on the sights you see via a two-way radio headset. Explore the depths of the majestic Grand Canyon from the air and witness the awe-inspiring beauty of this natural wonder. After soaring for 40 miles (64 km) over the West Rim, you’ll return to Las Vegas for a fabulous tour of the dazzling Strip!